is a graduate of Oxford University who served seven years in the army. After completing a MBA at London Business School he worked as a strategic management consultant for Marakon Associates and then in the computer games industry. In 2006 he founded InnerDrive, a mental skills company that helps people develop the right mindsets to do well at school, in business, in sport and in life. Over the past decade, Edward has designed and delivered student workshops, parent workshops and teacher CPD at hundreds of schools in the UK and around the world. 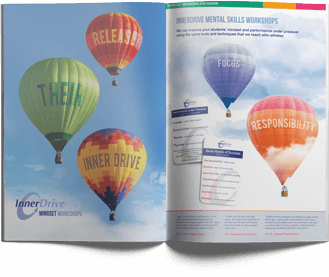 is a chartered psychologist and director of InnerDrive. He is one of the leading experts on how psychological research can best help students and teachers improve how they think, learn and perform. He wrote two regular blogs for The Guardian: ‘The Science of Learning and Teaching’ and ‘Lessons From Research’. Outside of education, he works with Premiership and international footballers, as well as has helped members of Team GB win medals at London 2012 and Rio 2016.